Thanks to chance and DBF being late for work and carrying my precious enveloppe wherever he goes... Lili finally got the pouch I made her last week. This is the thing I was stitching and couldn't tell you about. 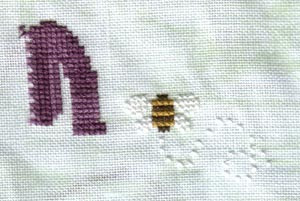 And when I saw that design from The Sampler girl, I knew I had to stitch it for her !!! In the meantime I had made the fimo rose pins, so I included a few in the package as well. The chart doesn't include a colour key, but you know me, I like choosing my own colours... So I decided to stitch everything DMC, so the pouch would be washable (a must for carry-it anywhere pouch). I made her eyes blue like mine, same hair colour, only the shape of the hair is more Lili's than mine (!!!) but I didn't want to stray too far from the original design. 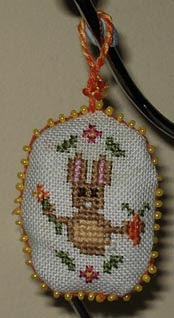 I added 2 roses in bullion knots as a bonus. The pouch itself.. I found that fabric in Hobbycraft, and the inside fabric is yet again a Flower Fairies fabric from the market a while ago... There's also an inside pocket. Ginny, I intentionally bought a house end of terrace, but away from the car park area to avoid noises of people coming back home late (or leaving early). My previous house was next to the car park and the noise was disturbing indeed ! Zohrah, glad to see you here... and glad to see you stitching again !!! 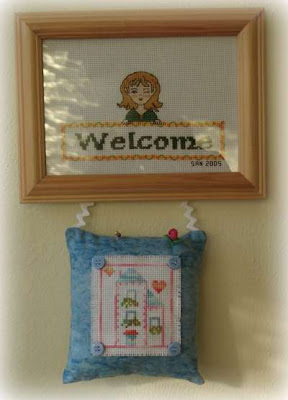 Are you stitching the new "Home of a needleworker", or the old version? I thought about you yesterday because the nice optician lady's name yesterday was Begum !!! People who followed the glasses disaster a few weeks ago will be happy to know I went to the optician yesterday, I had all the tests done, including a photograph of the inside of my eyes, and I have very healthy eyes. The only problem is they are better fit to see small details like stitching over one on 40ct, than seeing far away ;) But I'll ended up with new glasses (the optician nearly had an heart attack when I told her I have no spare!!!) in a week or so (lenses need to be ordered...). In the "everything falls apart" section, the coffee maker was dripping so had to be replaced. Well, tomorrow we will have a fun day at Excel's Stitching and Creative crafts expo, and despite the apparent small size of it, it will be a nie day out. After all, day out with stash is better than day out without !!!! Grace a un peu de chance, et un retard de DBF pour le boulot, et le fait qu'il se balade partout avec ma precieuse enveloppe, Lili a enfin eu son cadeau, une trousse de brodeuse que j'ai faite la semaine derniere sans pouvoir en parler. Ca fait un moment que je voulais lui faire quelque chose car elle se sent pas bien, et des le depart je voulais faire une trousse. Une brodeuse a toujours besoin de trousses: j'en ai deux, et je pense en faire une troisieme, pour avoir quelque chose de plus printanier. Alors quand j'ai vu le design de The Sampler Girl, j'ai su que c'etait pour elle ! Comme j'ai fait les roses en fimo entre deux, j'ai aussi inclu ca dans le paquet. J'ai tout brode en DMC car je voulais que la trousse soit lavable, un must pour une trousse censee se balader un peu partout. La ou la brodeuse va, la trousse et la broderie a l'interieur vont. La grille est presentee sans references de couleur, mais vous savez deja que ca ne me gene pas ! J'ai mis des yeux bleus comme les miens, et la couleur de mes cheveux, mais la forme est plutot ceux de Lili, mais je n'ai pas voulu changer le design d'origine. Et j'ai ajoute 2 roses en point de poste pour le fun. Le tissu externe vient de Hobbycraft, tandis que l'interieur est a nouveau du tissu "Flower Fairies" que j'ai eu au marche il y a des annees. J'ai aussi cousu une pochette interieure. Lili vous donnera ses impressions elle meme sur son blog, ou lisez ses reactions dans les commentaires du post precedent !!! Les gens qui ont suivi l'epopee des lunettes seront ravis de savoir que j'ai ete chez l'opticien hier, pour un test complet, incluant une photo du fond de l'oeil, et l'opticienne a dit que j'avais des yeux en parfaite sante. Le seul probleme est que ce sont des yeux adaptes a la vision minuscule de pres, genre broder sur un fil, et pas pour voir de loin. Donc dans une semaine a peu pres, j'aurai des nouvelles lunettes. Dans la section "tout tombe en panne", la cafetiere a rendu l'ame, en coulant d'endroit suspects, donc il a fallu la remplacer. Is this post too long? Is the weather fantastic and you want to be outside? Here, England being England, the weather changes from hour to hour... Fun fun fun ! Still have problems with my neck, but now it's just a bit blocked, and the headache is under control. So... youhou ! I spent a week talking about Curly Q Ewe's progress without showing anything... so here it is !!!! If you check Pink canary and Passionnee versions, you will see our stitching plans are quite different, that's the fun of a SAL ! Not the weird colour of the flowers: they are in 211 instead of the colour of the jumper. How did that happen? I had prepared the DMC 211 and I think I wanted to stitch something in that colour, then I went to do something else for 24h, and when I came back... I stitched the flowers !!! And here is also a picture of the flower I made with Tara's tutorial, using a water bottle cap. About the lost threads: I did receive the CC threads on Valentine's day or the day before, and drooled over them as they were so lovely.... They got into the mess of my stitching table, but then... gone ! So I can only hope it's somewhere in the house... But where? Chiloe asked about my house and stuff... Let's contemplate this a minute. My house is great. The neigborhood seems calm, but it's winter, so we will see... So far so good on the kids front. Lili, I doubt DBF has my threads, but please please pretty please send DS of DH or yourself to DBF to retrieve the precious enveloppe I left him for you. You really need it, so go go go !!!! Ali, nice to see you around, I do think I will go to Olympia in a quick in and out notion, that's how I do it when I go to expos alone... Still have to get my ticket though. Are you going? Nela, I don't like tea, but your tea pots are amazing !!! J'ai toujours des problemes avec mon cou, maintenant il est un peu bloque, mais je n'ai plus mal a la tete, donc c'est une amelioration. Ca fait deux jours que je ne brode pas, j'espere me rattrapper ce soir !!! Apres avoir parle une semaine entiere de mon progres sur Curly sans montrer de photo.... tadaaaa ! Comme vous pouvez le constater, Pink Canary, Passionnee et moi avons une approche tres differente du projet, c'est ca le fun du SAL !!! 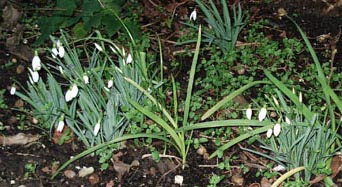 Et voila aussi une photo de la fleur pique aiguille d'apres le tuto de Tara. Moi j'ai utilise un bouchon de bouteille d'eau. Chiloe me demandait comment etait ma maison et tout ca... pour l'instant, c'est super. Le quartier est calme, a part la maison d'a cote qui est occupee par des jeunes hommes en colocation, et qui recoivent des amis souvent, mais rien qu'un peu de metal rock ne puisse sauver.... Pour l'instant, pas d'enfants, mais il faut attendre l'ete pour etre sur... La maison est aussi idealement placee pour le boulot, la piscine (ou on commence a me connaitre ! ), le supermarche... Donc en fait, si le boulot allait bien et que j'avais pas de problemes d'appareils electriques qui tombent en panne ou de locataires non payeurs, ca irait super ! Lili, je doute que DBF aie pris mes fils, mais par contre tu devrais envoyer DS, DH ou meme toi-meme pour recuperer l'enveloppe que je lui ai confiee pour toi. Tu en en as beaucoup tres beaucoup besoin, crois-moi.... Donc... go go go !!! Nela, je n'aime pas le the, mais tes theieres sont fantastiques !!! I seem to be afflicted by a neck/head ache, and it is difficult to concentrate and stare at the computer, so you will understand I have don't update daily. No stitching, no update like they say. I did make one of Tara's little flowers, and I stitched on Curly on Sunday night, only to use the wrong colour for the flowers !!! Also, big drama, I lost the Crescent Colours threads for "Home of a needleworker (too)". Knowing how expensive these threads are, I'm far from happy. En plus j'ai un mal de cou/tete qui n'en finit pas, ce qui fait que j'ai du mal a me concentrer et a regarder l'ordi. Dimanche j'ai quand meme fait une des petites fleurs de Tara, et continue Curly, mais j'ai reussi a broder les fleurs avec la mauvaise couleur !!! Here is my first Easter ornie, front and back. I had loads of fun designing this. I actually ended up designing as I stitch ! Technical details: stitched on my green marbled 32 count linen, over 2. The 2 pieces are sewn in "biscornu like" technique, incorporating seed beads. The cord was hand made with the orange and yellow threads of the design. As I merrily created on the go, I took pictures and prepared notes for you. I guess this is the part justifying paying the designers for charts: the charting and pdfing part. Meaning I have quite some computer time to spend before I can get the chart out. I am already planning on doing more: getting a real egg shape (here it's more of an oval), and more designs. It will be fun. Une mise en bouche seulement (ie. le produit fini sans la grille !!!) car j'ai pas vraiment le temps.. J'ai pris les photos pour le tuto pour faire l'oeuf, a la maniere des biscornus en fait, avec des perles en prime. J'ai cree surtout en brodant, ce qui etait tres fun, et j'ai encore d'autres idees pour en faire d'autres !!! Evidemment, avec DBF partant aujourd'hui, et maman arrivant demain, ya pas trop de temps, mais bon.. c'est la vie !!! Now I'm dreaming of many eggshaped designs to put on my mug tree... Seems like I have some work to do !!!! Malgre un mal de tete persistant, j'ai commence a broder mon petit lapin de paques, que j'ai dessine plus tot dans la semaine. Au depart je voulais faire un truc carre, comme le bonhomme de neige, mais en arrivant a la photo ici, j'ai remarque la forme d'oeuf... donc j'ai decide d'essayer un truc nouveau en forme d'oeuf. 3. Curly doesn't progress because of 1. and a little bit of 2. 3. Curly n'avance pas a cause du temps passe sur 1. et 2. You might have noticed I'm a bit remote... of course we can "blame" DBF's presence, stitching time is reduced a lot, but also I don't feel like blogging. Not only do things tend to break down and problems to come, leaving me in an Alice in Wonderland kinda bad dream, but I'm down with a case of "What's the point?" Now you won't be surprised if I barely progressed on Curly Q Ewe. I made the grass, and it was longer than it appears as it's 2 big blocks of green. Vous avez peut etre remarque ma plus ou moins absence... On peut "blamer" la presence de DBF, mais c'est plus profond que ca, je n'ai pas vraiment envie de blogger. Non seulement je suis frappee par une epidemie de choses qui se cassent, mais je vis dans un monde denue de sens pour moi. Et je suis contaminee par du "Aquoibontisme aigu". Donc, frustration, et aucune envie de se lever le matin pour faire quoique ce soit. Vous ne serez donc pas surprise de voir que Curly n'avance pas, et en 2 jours je n'ai fait que l'herbe, qui quand meme represente plus de boulot qu'on ne le croirait. A little saturday morning crafty blob... For a while I admired those lovely pins with flowers or other stuff on... And I thought "I could do that with fimo !!!" But then I remembered my oven is broken (yes, I'm not the luckiest in the world at the moment...), so I searched for microwave fimo cooking alternative. Note that it's written on all Fimo packages that you can't cook in the microwave, because of the fumes. But some people experimented with cooking small fimo objects in water in the microwave, and guess what? It works !!!! And it only took 3 minutes !!! Of course I did it on a tiny thing, in old hardened fimo... But it could be the answer to my cracking fimo in the warm air oven !!!! Plus Curly seems to have huge blocks to stitch... I'm still in the sheep and I used 2 6 strands threads already !!!! 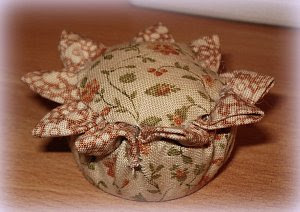 I've put my mini rose in the cushion Lili made me for Christmas. It's hung in the hall, under my "Welcome" frame, so it's the first thing I see when entering the house. 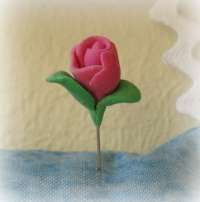 Une petite rose en fimo sur epingle... Juste un petit test ! Enfin, la difficulte a ete que mon four est casse, et donc j'ai cherche des alternatives sur internet pour cuire au microondes (un truc interdit d'apres le fabricant, pour cause de fumees toxiques), et j'ai trouve ! Il suffit de mettre dans de l'eau, et de ne cuire que 3 minutes. Ca marche pour les mini trucs, evidemment... je doite que ca marche pour les trucs plus gros ! J'ai pas beaucoup brode hier, vu que j'ai eu "PicPic" et "Cooking Mama 2" pour ma DS, et vous savez ce que ca signifie... Sinon ben Curly est plein de gros blocks, je suis encore dans le mouton et j'ai deja utilise 2 fils de 6 brins !!!! J'en profite pour montrer le coussin que Lili m'a offert a Noel, et sur lequel j'ai mis la rose. Il est dans l'entree, si bienque c'est la premiere chose que je vois en rentrant !!! First... a bit of real stitching... with Curly Q Ewe. 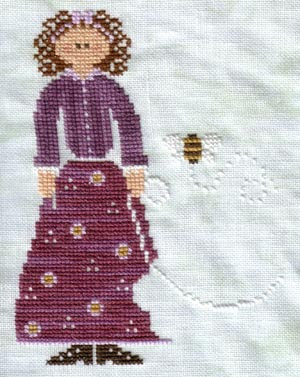 We are now 3 in the Stitch Along, as Isabelle Passionnee joigned us. Fun fact: Curly, in French is a peanut flavoured cheesy puff. So yesterday was Valentine's day... 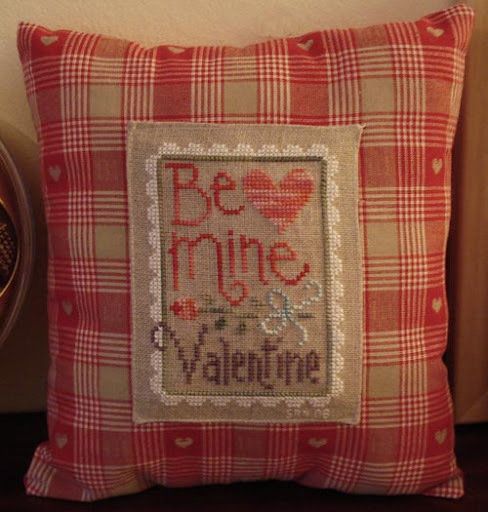 So of course it was time for romance and not much of stitching. 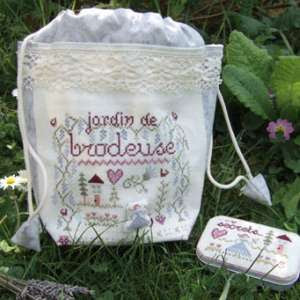 But I got a stitching gift in the form of "jardin de brodeuse" chart from Tournicoton. Yesterday after work I caught DBF in my craftroom... Card making ! He painted this card, and stuck my favourite flower stitckers on it. We stayed home, made experimental cuisine, and watched "Playing by heart" on dvd. I even made the fireplace work, so you can see the romantic setting in from of the fire, with crackers and all. So DBF made some experimental cuisine. It's basically mashed potatoes and ham on a bed of iceberg lettuce. I made the mashed potatoes following a family reciepe, and DBF made ham hearts. Now I have a 3 days week end, I might even do a bit of stitching ! Tout d'abord, un peu de broderie... Nous sommes desormais 3 dans le SAL, vu que Isabelle Pasionnee nous as rejointes. 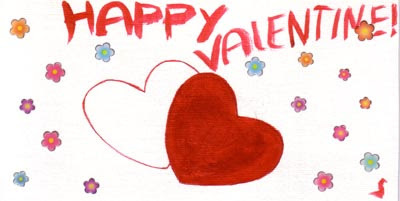 Hier c'etait St Valentin, et en rentrant du boulot j'ai decouvert DBF entrain de me faire une carte avec de la peinture et des stickers !!!! On a aussi fait un plat experimental a base de jambon, puree et salade. J'ai fait la puree a l'ancienne,e t DBF a fait des coeurs de jambon. J'ai meme reussi a allumer le feu ouvert au gaz (j'avais pas encore esaye), et donc vous pouvez voir notre installation romantique. On a regarde "Playing by heart" en dvd, c'est un vieux film avec Gillian Anderson, Sean Connery et plein d'acteurs connus. Le plan "Valentin a la maison" etait bien inspire vu le froid penetrant au dehors !!!! I was supposed to do that earlier, when Heidi tagged me... I think most of the stitchers I know already answered this meme, so if you come over here and haven't been tagged yet, considered yourself tagged !!! 2. I used to love starting projects, and rarely finishing them. 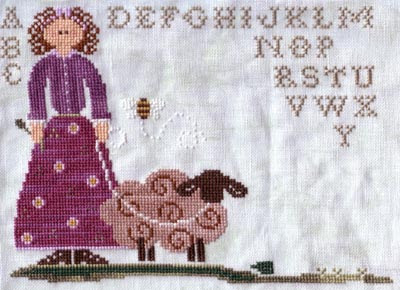 When I was younger, my mom had to finish stitching more than one project !!! 3. I'm bilingual French/English in a weird natural way. My brain switches to one or the other language as necessary. Sometimes I'm not even aware which language I'm reading in, especially on computers where softwares can be in those languages. 4. As long as I can remember I've always loved swimming and being in the water. It's like second nature. 5. I'm ambidextrous. Originally I was left handed, and that's why I draw and stitch with my left hand (to my grandma's demise !!!!). I write with both hands, and play with the DS stylus with either hand as well. Weirdly enough, I crochet the right handed way, mostly because I self taught me and just followed the book instructions !!! 6. I'm a geek. Computers, video games, science... how does crafts fit in there? Les 7 choses bizarres a propos de moi... c'est marrant comme les blogs en francais font 6 au lieu de 7... Les memes semblent muter avec le temps et le voyage de blog a blog ! Comme je dois etre une des dernieres a y repondre, je tagge toute lectrice qui n'a pas encore ete taggee. 1. J'aime le rock metal. Plus ca fait du bruit, plus j'aime, a moins que ce soit vraiment du hardos bourin, la ca va pas. Ca detonne pas mal avec mon exterieur classique et feminin... Ah, si seulement ils pouvaient entendre ce qui se passe sur mon walkman (mp3 quand meme... mais je reste fidele a Sony, donc pas de ipod). 2. Je suis biligue francais/anglais, mais mon cerveau fonctionne de facon bizarre, avec un bouton on/off qui passe d'une langue a l'autre. Parfois je ne me rends pas compte de la langue que je lis !!! 4. J'ai toujours adore l'eau, c'est comme si j'avais ete dauphin dans une autre vie. 5. Je suis ambidextre. Enfin, gauchere contrariee, mais si je dessine et brode de la main gauche, j'ecris et je manipule le stylet de la DS des deux mains, et je crochete de la main droite. Ceci est surtout du au fait que j'ai appris toute seule avec un bouquin, et evidemment j'ai suivi a la lettre ! 6. Je suis une geekette. ordi, jeux videos, sciences... comment je suis autant dans les crafts? After all my blabbing, here is a picture heavy post. I know you love those (I love those...). For some time, I was preparing stuff for Valentine's day, making bits and bobs... and here is the final result ! First, the mantel piece... From left to right, you see a mini Tweety holding a heart. It was a Christmas gift from DBF, and he said himself it was more fiting for Valentine's day, so I've put it on my mug tree (supposedly a display tree, but I don't use it to its full potential yet). Then you have Valentine crackers, similar to Christmas crackers, but "love themed". As DBF wanted to treat Valentine's evening as Christmas eve, I thought these were fitting ! Then we have the love cats, turned into a cushion. I actually made both cushions the same size and all as I knew they would be displayed together. I only closed them yesterday evening. In the middle you have a heartshaped Ferrero Rocher box, as these are DBF's favourite chocolates (I don't like them myself, it removes the temptation ;), and on top is the February heart. Next we have the gifts. The little brown one is for DBF, the pink bag "For you" is for me. 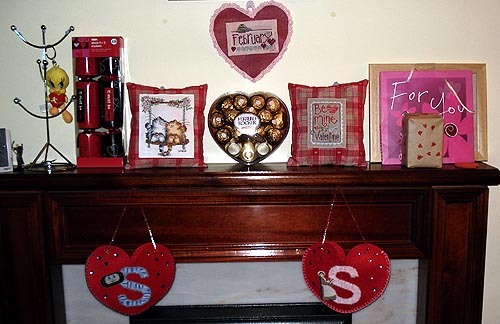 At the bottom are the 2 Valentine stockings, filled with heart shaped chocolates. The left blue one is DBF's, with a mini PSP video game console. The right pink one is mine, with a stitcher, which is taken from LHN Stitcher's prayer. The felt hearts were taken from bag kits for kids (other pieces are right pink !!! ), and I added some heart gemstones. The stitched elements took ages as it's on plastic canvas, and even if I like the finished pieces, it's not nice to stitch. I feel that something stitched on plastic canvas is already an object in its own right. You can carry it around, manipulate it without fear of creasing or fraying the fabric, and it stands on its own. I abandonned the garland idea, and the felted hearts with miniatures on them, mostly by lack of inspiration and time. Now I will be able to stitch full time on Curly Q Ewe !!! Apres des posts tout en texte, voici des images, comme on aime... Ca fait un moment que je parle des preparatifs de St Valentin, et j'ai enfin fini hier soir. Donc voici la cheminee, avec de gauche a droite, un petit Titi portant un coeur, que j'ai eu a Noel par DBF. Comme il fait plus St Valentin, je l'ai accroche a l'arbre a mugs (normalement pour accrocher des decos, mais pas encore utilise a son plein potentiel...). Apres nous avons des crackers de St valentin, comme ceux de Noel, et comme DBF veut celebrer St Valentin comme Noel, ca me paraissait tres adequat ! Ensuite nous avons les petits chats, en version coussin. Les deux coussins sont de la meme taille en fait, car je savais que j'allais les mettre en pendant sur la cheminee. Au milieu il y a une boite de Ferrero Rochers, pour DBF (moi j'aime pas), en forme de coeur, et au dessus le coeur de Fevrier fait il y a un bout de temps. Finalement a droite nous avons les cadeaux, le mien est dans le sac rose. En dessous nous avons les sacs de St Valentin, remplis de chocolats en forme de coeur. celui de gauche avec le S bleu est celui de DBF, avec la petite console PSP, et le mien est a droite, avec la petite brodeuse qui vient de "Stitcher's prayer" de LHN. A l'origine les coeurs den feutrine viennent de kits pour petites filles pour faire des sacs. Je n'ai utilise que les gros coeurs rouges, laissant les perles, les rubans et les trucs rose clashy. Ce qui a pris le plus de temps sont les elements sur canevas plastique. J'adore quand c'est fini, mais c'est dur a broder. J'ai toujours l'impression que quelque chose de brode sur canevas plastique est un objet fini en lui-meme, qu'on peut manipuler comme on veut. J'ai abandonne l'idee de la guirlande, ainsi que les miniatures sur feutrine, par manque de temps et d'inspiration. Enfin, maintenant que mes devoirs sont finis, je vais pouvoir me consacrer a Curly Q Ewe !!! Despite what Lili would tell me, we are social beings... I was talking to my glasses escapade to a collegue,and she suggested Vision Express, as they make the glasses in shop. So after work I visited them, and the lady said she could only shage the pads for bigger ones, because she couldn't widen the metal parts being already against the glass. Nice and patient, she changed the pads and bingo ! Not only it doesn't hurt anymore, but I see as usual... And all this free of charge ! So it should be ok, at least better than before, as this afternoon I had to put my lab glasses on to relieve the pain !!! No stitching so far, byt I bought "Quick cards made easy" for the Margaret Sherry teddies decoupage, and "Classic Inspirations", an Embroidery magazine I didn't know. Quoique Lili en dise, nous somme des etres sociaux... Et en parlant avec une collegue, elle me dit d'essayer Vision Express (je crois que c'est la version anglaise de Grand Optical) car ils font les lunettes sur place. Du coup, j'y suis allee apres le boulot, et la dame, gentille et patiente, m'a mis des pads plus grands, et tada !!!! vision comme avant, et plus de douleur !!!! Ok, this will be a long rant with no stitching in it (well, barely...) Some of you showed support and concern and I'm very grateful for that.... thanks ! Now, let's see the facts first. Until Friday morning when I had the nose pads of my glasses changed, I was a happy camper, seeing nicely from far to near, no problem. Change pads, and my vision is... weird. I can still make up stitches at a distance of 50cm (well enough to draw the pattern I mean), and stitching is no problem. The pads were 1mm before and now they are 3mm. Optic 101: when you have lenses for very short sighted people, you can only see in the center of the lens. Conclusion: glasses are not aligned anymore, and they pinch my nose, giving a delightful impression of being punch in the nose at times. Would I still be in France, I could go to any optician, no questions asked, they stick the glasses in that gizmo to check measurments, check you, readjust, and voila ! So you can imagine my surprise when the UK optician (well, I doubt he was a real optician) tells me they can't do anything because they don't have the glasses measurements as they didn't make the glasses !!!! All they can do is get a new eye test, prescription and glasses !!! In my case, you can count about 300 pounds for the whole operation, when all I need is a few bits of metal bent a little bit, if only to make the nose pads more comfortable !!! I came out of there in tears... DBF not really understanding why I was taking it so badly. So all I can do is wait for Easter week end and get my glasses checked by a competant optician in France. No way I would bring my business in England where opticians are basically shops, with no competance. Friday's headache was simply due to stress, I get a lot of that these days... And the skin surronding my eyes has a bad reaction to the pool chlorine. Des nouvelles, mais pas vraiment de broderie... Merci de vous inquieter pour moi... La saga lunettes est loin d'etre terminee. Avant d'avoir eu les pads de nez changes, la vision est un peu bizarre. Je vois encore au loin et de pres, mais c'est pas pareil. Avant cette operation, je voyais tres bien. Apres, bof. Les pads etaient de 1mm d'epaisseur, et sont maintenant de 3mm. Comme les verres de gens tres myopes ne sont vraiment nets quand au milieu.... c'est pas dur de faire le calcul, faut reajuster les lunettes par rapport a ma tete. Je me souviens que en France, on va chez l'opticien, il mesure les lunettes et les yeux avec des appareils, chauffe le metal, tord un peu, et hop ! 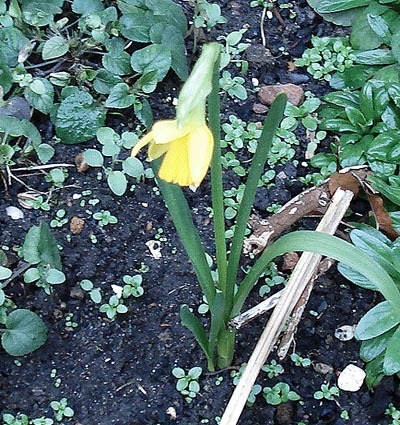 Comme neuf ! Ici en Angleterre, le mec dit que tout ce qu'ils peuvent faire c'est retester ma vue, et refaire une nouvelle paire de lunettes, ce qui dans mon cas couterait environ 3000 francs, car ils n'ont pas les mesures de mes lunettes, vu que je ne les ai pas faites faire chez eux !!! Evidemment, je suis sortie de la en larmes, avec DBF qui ne comprennait pas trop ou etait le drame... Le drame est que vu la difference d'epaisseur des pads, ca me pince le nez, et j'ai l'impression qu'on m'a boxee. C'est pas agreable. Le mal de tete de vendredi etait simplement du stress, et la peau autour de mes yeux fait une reaction au chlore de la piscine, donc c'est pas jojo. 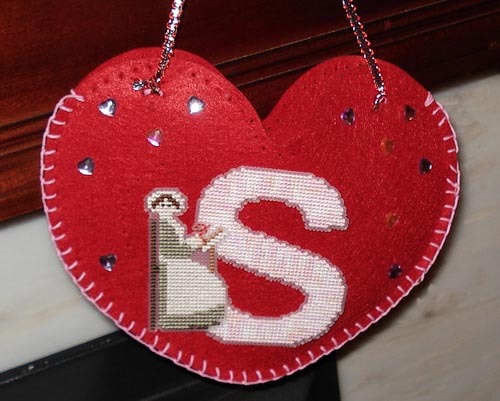 J'ai quand meme fini mon "S" pour les sacs St Valentin, il ne me reste qu'a finir la petite brodeuse, et assembler le tout ! I want to thank you all for your input on "Moods of the heart". You are all right. This has been very helpful. Il ya de ces jours ou on se retrouve sur le sol, les larmes dans les yeux.... C'est le cas ce matin, car un aspirateur qui n'aspire plus alors que ya rien qui coince a premiere vue, alors qu'on doit absolument passer l'aspirateur sur les moquettes creme... C'est la goutte qui fait deborder le vase. Hier, j'ai meme du me coucher tot pour cause de migraine de stress, et donc pas de broderie... Ce qui explique que Curly n'avance pas, mais comme Pink Canary travaille aussi sur d'autres choses, c'est pas bien grave. Merci beaucoup de votre avis sur "Moods ofthe heart", ca a ete tres constructif. I actually have another design idea, that could be more to our tastes, but then I started thinking: if I design stuff close to LHN, CCN and sampler type of design, how useful would it be? There are so many great designs out there, why would I come with my own, especially if it lacks personality? Merci pour votre avis, c'est ce que je soupconnais, vous etiez trop gentilles pour me dire que c'etait nul ;) Honnetement, ce'st pas trop mon style non plus, mais voila, j'ai un probleme. Le style que j'aime en ce moment, LHN, CCN, et autres samplers, est deja fortement represente par de nombreux designs, alors, pourquoi en ferais-je d'autre, qui ressembleraient a ce qui existe? mais j'aimerais votre avis sur la question !!! 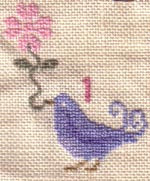 A little blue bird , wip freebie from Midsummer dreams... It is supposed to be a happiness bird, but does it corrolates in real life? 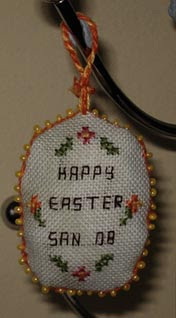 It's stitched over one on 32 count linen. Let's face it, "Moods of the heart" seems to be a bust. I got barely no reaction out for it, especially if you compare with my snowman fob. Do you like it? Why not? What makes you not liking it? 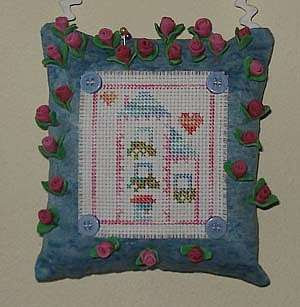 Is the style not in your tastes, or is the design and layout not fit for a project you would want to stitch? Is it too bare, too naive, too what? I'd be grateful if you give me some feedback, as it would help me develop my designing skills. I'm still searching for my style, so I need input from stitchers !!!! Un petit oiseau bleu, freebie de Midsummer dreams... Ca devrai eter l'oiseaud u bonheur, mais l'est-il vraiment? C'est brode sur un fil, sur du 12fils/cm. Monfreebie "Moods of the heart" semble ne pas plaire... Je n'ai pas eu beaucoup de reaction de voter part, surtout en comparaison avec mon bonhomme de neige de Decembre. Bon, c'est pas grave, je dois avouer qu'il y a quelque chose qui me chiffonne avec le design, mais je ne sais pas quoi, alors ce serait sympa de me dire si ca vous plait, pourquoi non, si ce'st le style, ou le dessin qui n'est pas adapte a quelque chose que vous broderiez, est-ce trop nu, trop difficile... etc... Ca m'aiderait a evoluer, vu que je n'ai pas enore trouve ma voie et mon style !!! 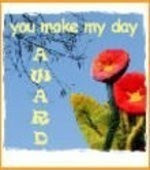 Pink Canary just awarded me with this "You make my day" award. I love reading blogs, even if I'm not the best commenter in the world. Sometimes I just have time to skip from one blog to the next on my Bloglines, but also sometimes I can't find anything to say that hasn't been said before, so I remain silent. Like many of us, many bloggers "make my day". You can see the links all over my blog page. If there's a blog I like to visit, I subscribe to it in my Bloglines, and I go as soon as there's an update. Nominees please carry this forward by choosing 10 blogs to nominate, and tell the people in a comment on their blog. Pink Canary vient de me donner un "You make my day award". dans l'ideal, je devrais nominer tous les blogs qui sont presents sur ma page, vu que ce sont les blogs presents dans mon Bloglines, et que je lis des qu'ils sont mis a jour. J'espere que les nominees prolongeront le jeu en nominant 10 blogs a leur tour, et en avertissant ces personnes par commentaire sur leur blog. First, I forgot to say yesterday that I introduced the French speaking blogs I read, in the left sidebar (it's there just because the right sidebar is a bit crowded, that way it's a bit more equilibrated). Blogs in the sidebars are my Bloglines reads. So it means that these days loads get added. I dunno if it's really useful to you as visitors or not. Second, I'd like to draw your attention to the first discussion on my website. I'll try to add some as I get inspired. It is supposed to be a nice big debate, so join in ! Tout d'abord, comme je me lance de plus en plus dans le francais... j'ai mis les blogs en francais que je lis, sur la barre de gauche. Comme tous les blogs lies sur mon blog viennent de mon Bloglines, attendez-vous a voir pas mal de nouveaux liens avec le temps ! Deuxiemement, J'ai introduit la premiere discussion sur mon site (et oui, l'enonce est en francais aussi). Venez donc debattre de sujets broderie !!! 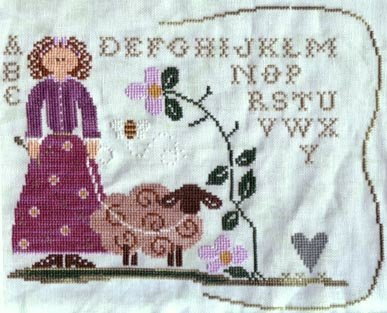 Curly Q Ewe in the thread... With just touches of Weeping willow missing. The hardest was the skirt. So much to stitch I nearly had to use all my 5 yards of pickled beets. I love the colours of the clothes though... This time we can see variations in the CC threads. Earlier I took the opportunity that Ehandcraft was doing free postage to get some more Crescent Colours threads, alongside with Home of a needleworker (too), garden girl and Everybody does the hop. 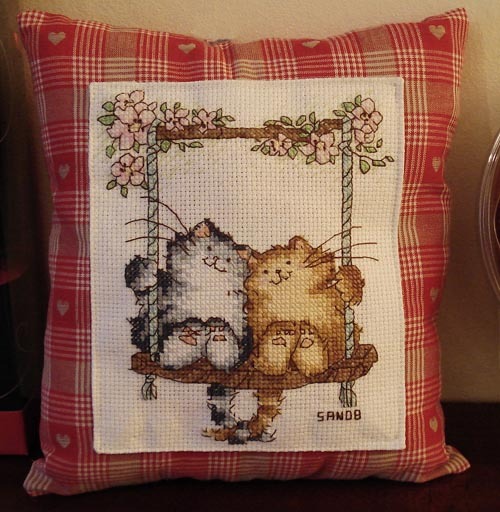 If you enjoyed seing the Love cats grow, maybe you will want to see Patternnuts stitch hers. 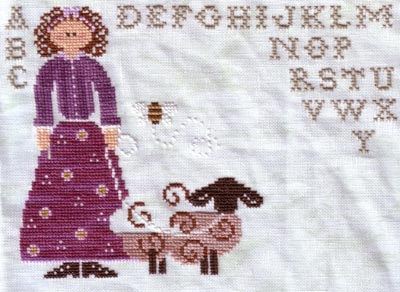 knowing how difficult the project is, and it's her first Margaret Sherry pattern on top of it... please go and encourage her to continue ! Curly Q Ewe apparait... dans une jupe geante. Il m'a fallu preque toute l'echevette de fil pour la faire !!!! Tout a l'heure j'ai passe commande a Ehandcrafts de fils Crescent Colours (commeles vetements de la fille), et de quelques charts, profitant que les frais de port etaient gratos. Si vous avez aime les petits chats que je viens de broder, allez encourager Patternnuts qui est entrain de les broder. Connaissant la difficulte du projet et le fait que c'est son premier Margaret Sherry, elle risque d'en avoir besoin ! 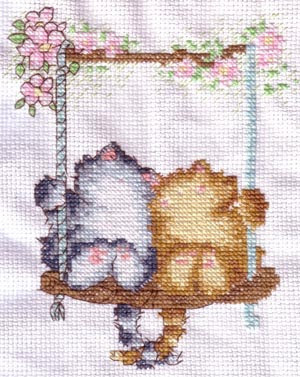 I finally finished the little cats this morning. And Be Mine Valentine yesterday evening. And I made them little cushions I didn't take pictures of yet. J'ai fini les petits chats ce matin, et Be Mine Valentine hier soir. Et je les ai transformes en petits coussins, mais j'ai pas encore pris la photo. Well, February starts and I'm not in an happy place right now... So... let's get on with the business. First, Pink Canary and I started Curly Q Ewe yesterday. I'm stitching it on a green marbled linen (32 count) I got at K'thylda over Christmas. I started with the bee, and then the cardigan in CC thread. I already made a mistake in the sleeve, and it's only at the end that I noticed it, so instead of frogging and making it again, I compensated the best I could. 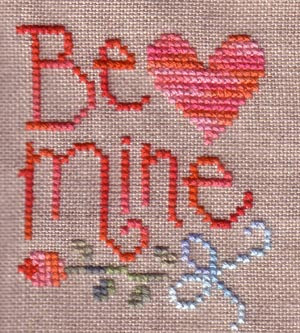 On Thursday night I started Lizzie Kate's "Be Mine Valentine", and once again I managed to make a mistake in the "i" and "n" area, so I will also compensate instead of frogging. And finally a picture of the Love Cats... Still a lot to do there in the back stitching area. Ma vie est pas gaie en ce moment, alors... allons directement aux photos. J'ai commence le SAL Curly Q Ewe hier, avec Pink Canary. J'ai commence par l'abeille, et le cardigan de la fille. Evidemment, je me suis deja trompee dans la manche,e t comme je m'en suis rendue compte longtemps apres, j'ai juste compense pour que ca marche. La toile est du 12 fils lin vert marbre que j'ai eu a K'thylda pendant les vacances. Jeudi soir j'ai commence "Be Mine Valentine" de Lizzie Kate, et je me suis trompee entre le "i" et le "n", donc il faudra aussi compenser d'une maniere oud 'une autre. Enfin, une photo des chatons sur la balancoire... il reste encore beaucoup a faire de points arriere !!! Today is 1st of February, and you know what that means... SAL start for Curly Q Ewe. So far I cut the fabric and gathered most of the threads. I will start stitching tonight. 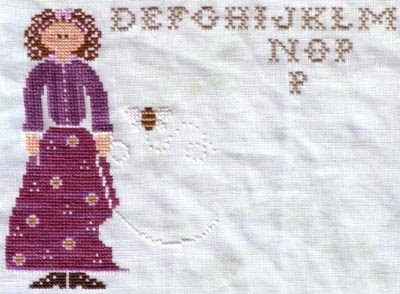 Pink Canary has just finished her School of Needlework in time for this new project ! Otherwise, you might have noticed I added "Events" to my news stream. 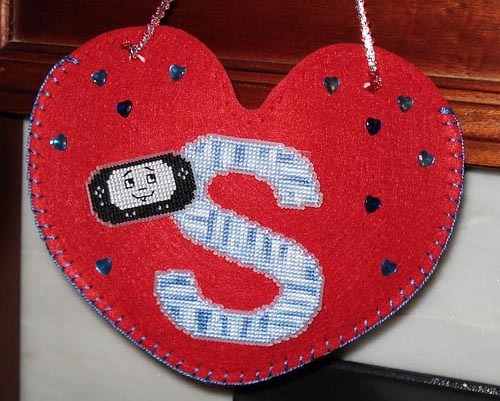 If you have any news or events you would like to share witht he rest of the stitching community, please drop me a line ! Pas d'image en ce moment... ce sera pour plus tard ce soir. Comme aujourd'hui on est le 1er Fevrier... c'est le debut du SAL Curly Q Ewe avec Pink Canary. Elle a justement fini son "School of Needlework" juste a temps. Pour l'instant, ma toile est coupee, et j'ai la plupart de mes fils prets, mais je ne commencerai que ce soir. Sinon, vous avez surement remarque que j'ai ajoute des evenements a ma section de news. Si vous avez des evenements et des infos a partager avec le monde des brodeuses, n'hesitez pas a me faire signe !